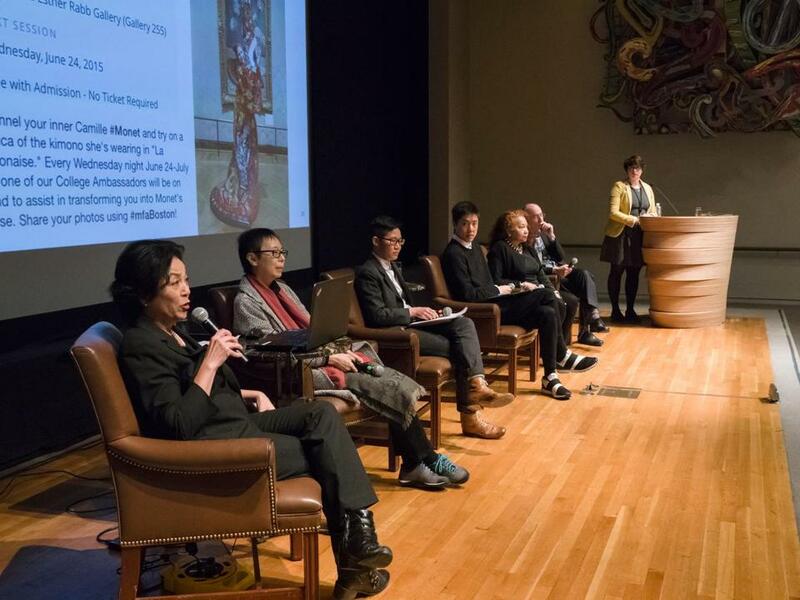 From left: Panelists Elena Tajima Creef, Reiko Tomii, Xtina Huilan Wang, Ryan Wong, and Barbara Lewis joined Museum of Fine Arts director Matthew Teitelbaum and MFA curator Jasmine Hagans (at podium) for “Kimono Wednesdays: A Conversation” at the MFA. 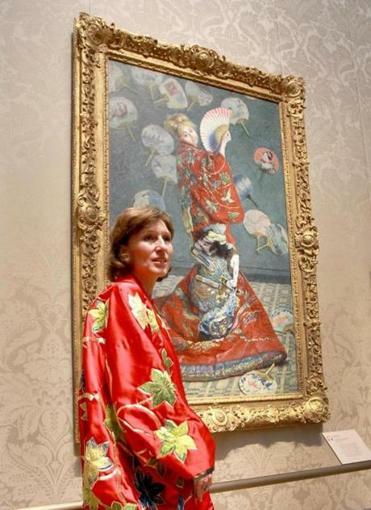 Sue Danielson of Kentucky, with Monet's “La Japonaise” at the Museum of Fine Arts on June 24. The museum had kimonos for people to try on and pose as Camille Monet did in the painting. With roughly 200 people piled into the Museum of Fine Arts’ Remis Auditorium on Sunday, MFA director Matthew Teitelbaum introduced the afternoon’s program with what can only be described as a rarity among museum directors in the institution’s 145-year history: a public apology. The director’s apology for the original “Kimono Wednesday” program, which actually took place before he arrived as the MFA’s new director in August, drew a round of applause. But if the audience appreciated Teitelbaum’s remorse, passions remained raw at “Kimono Wednesdays: A Conversation,” a wide-ranging and sometimes heated panel discussion and Q&A hosted by the MFA to address fallout from last summer’s event. After the original outcry last summer, the MFA reconfigured its “Kimono Wednesdays” program, but protests and counter-protests continued as the program repeated through July. “The event only replicated what Monet was supposedly criticizing without interrupting the racist legacy of the painting or any criticality of orientalism both in Monet’s time or in our own,” said Xtina Huilan Wang, a panelist who protested last summer’s program. 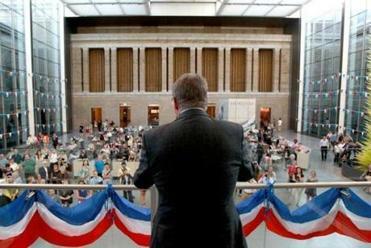 Museum of Fine Arts director Malcolm Rogers bid farewell to the public. “La Japonaise” is considered by scholars to be Monet’s wry commentary on an 1870s Parisian craze for all things Japanese. During the two-hour discussion, attendees took broad aim at Teitelbaum and the museum, accusing it of white supremacy, trafficking in racial stereotypes, and insufficiently grappling with its post-colonial legacy. Elena Tajima Creef, a women’s and gender studies professor at Wellesley College who moderated the discussion, said that the Monet painting invoked racial stereotypes related to blackface. “I’d like to know if the museum does now or intends to have conversations about what it means to have access to histories of people who maybe don’t even have access to their own history,” she asked. Some of the panelists and audience members appeared unaware of the museum’s ongoing efforts to examine the provenances of objects in its collection. Those efforts have resulted in several high-profile objects being returned to their origin countries. “Can you make that public somehow?” Wang said. Teitelbaum, who was repeatedly heckled by audience members, appeared visually shaken at times by the term white supremacy. In one particularly tense exchange with an audience member, he refused to answer a question about the museum’s endowment and the racial composition of its board of directors. Wang, who often dominated the discussion, interrupting audience members and other panelists, tried to define white supremacy more broadly. Some panelists also took a less combative stance. Independent scholar Reiko Tomii, for instance, discussed the cultural history and uses of the kimono and described the Japanese response to the controversy. Other panelists included scholar Ryan Wong and Barbara Lewis, who directs the William Monroe Trotter Institute for the Study of Black History and Culture at the University of Massachusetts Boston. “I don’t accept the white supremacy label, but I do accept what you’re saying, that collections are fraught with many histories,” he said. Malcolm Gay can be reached at malcolm.gay@globe.com. Follow him on Twitter at @malcolmgay. Clarification: This story was updated to more accurately reflect the remarks made by Xtina Huilan Wang.